Smoking is permitted outside the terminal building in the designated smoking areas. The smoking areas are indicated by a white dotted line and contain ashtrays. 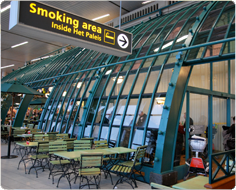 Smoking areas have been installed at various locations on Jan Delleartplein (outside in front of Schiphol Plaza) and on the departures level. Perimeter roads and the aprons form an exception to the rule: these areas must be kept smoke free to ensure airport safety. Beyond passport control, smoking is permitted only in the designated smoking areas, most of which are located at food service outlets. 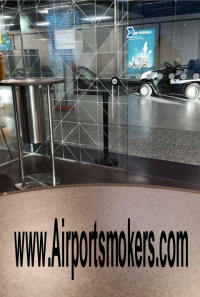 These smoking areas are enclosed rooms with their own exhaust-ventilation systems. To find the nearest smoking area, please consult the signs in the lounges. 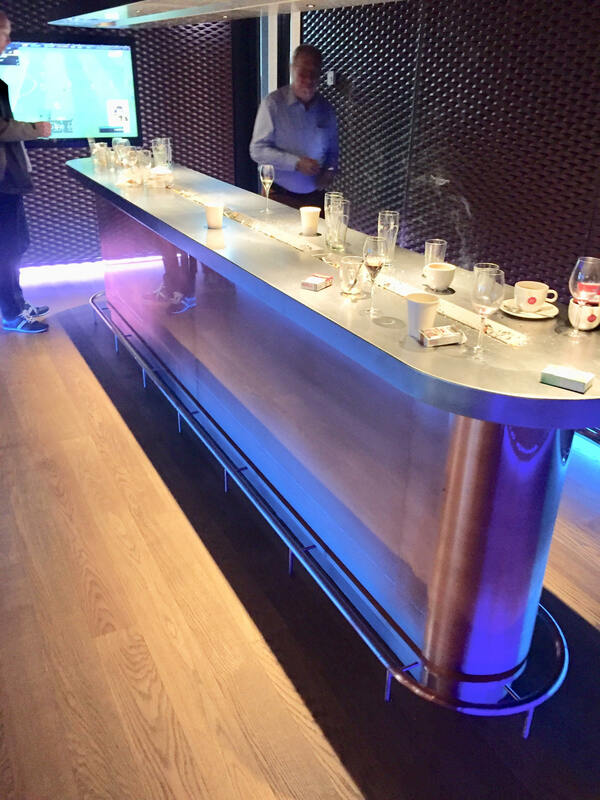 Update from Glenn, April 2019: The new KLM lounge (lounge 52) has a very nice smoking area within the lounge. Photo provided below. John d. Dec 2018: Gates G and H, AMS Schiphol. 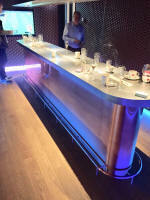 Bar and smoking room. Civilization. Madaline on the 14th Sept 2018: Smoking area found at gate B15 inside at tribune breakfast. Annemiek on the 5th Sept 2018: Gate M (lounge 3) also has a smoking area next to the light cafe. Last year it wasn't here so it must be built quit recently. Smoking areas are provided at the following locations. Simon: Additional smoking area in departures near Gates D1-D4, right beside the Heineken Bar. This is signposted as you enter Departure Area D.
Louis: There is a free smoking areas behind the restaurant right across from international Gate E9. W.King: In the airport of Amsterdam, Schiphol there is an Irish pub (Murphy's) where there is a smoke room at the back of the bar. In another part of the airport is a regular smoke room behind glass. Both have air-conditioning.